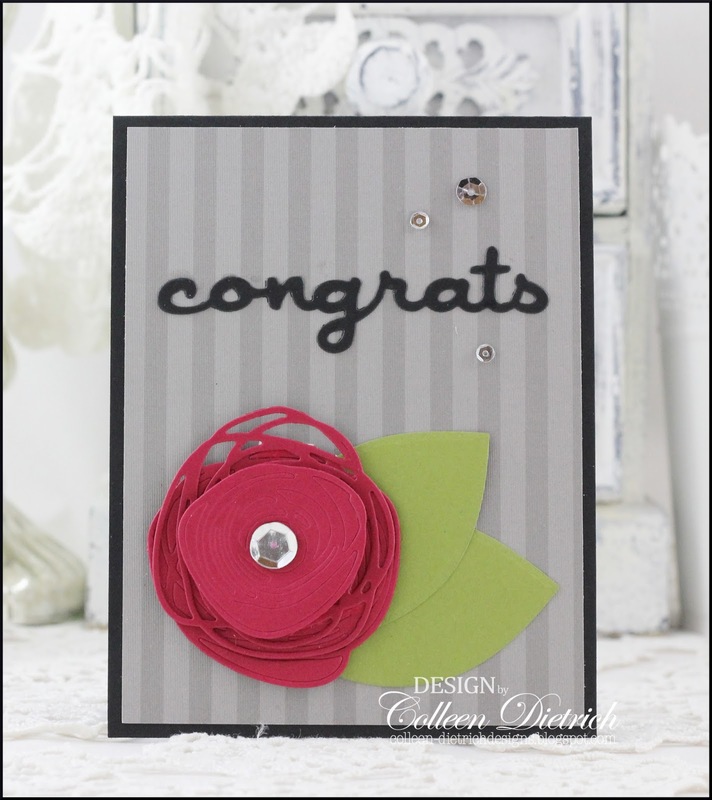 I'm sharing a card today that I CASE'd (Copy And Share Everything) a crafter named Jessica Frost-Ballas. If you have Instagram, here is a direct link to Jessica's card. Isn't it lovely? 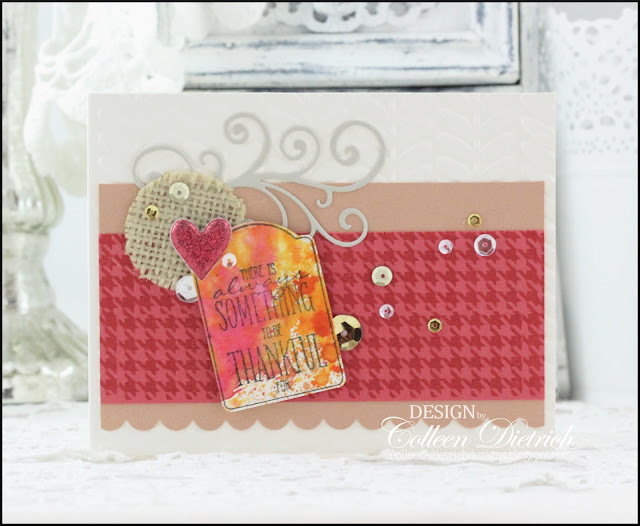 I changed the sentiment (Altenew), decided on a pure white background, and did not dove-tail the sentiment banner. Other than those minor changes, I kept many details that J did, because I love this design! 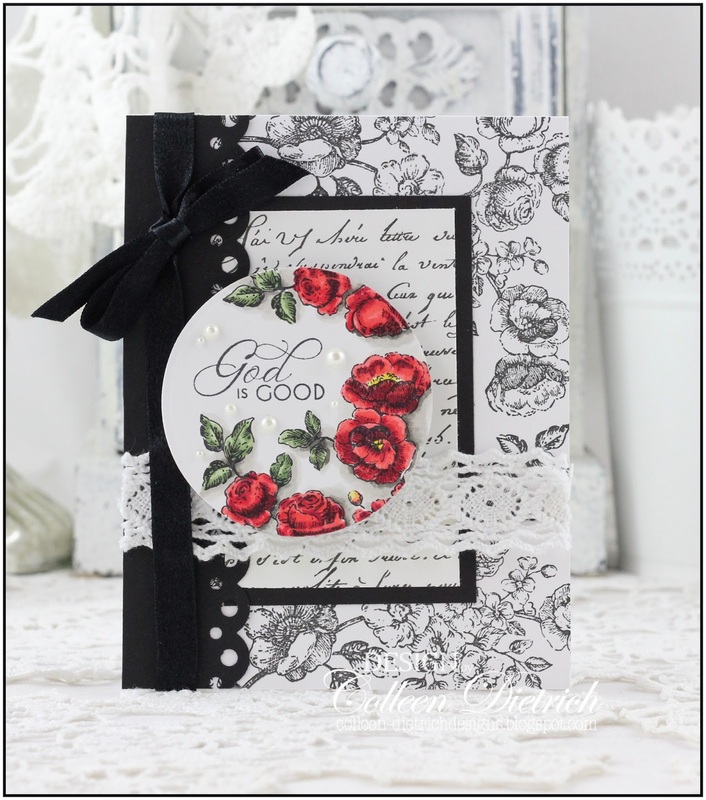 This gave me a chance to play with my neglected set, Ruby Reprise, by Papertrey Ink. All clustered together, I love the impact they give. 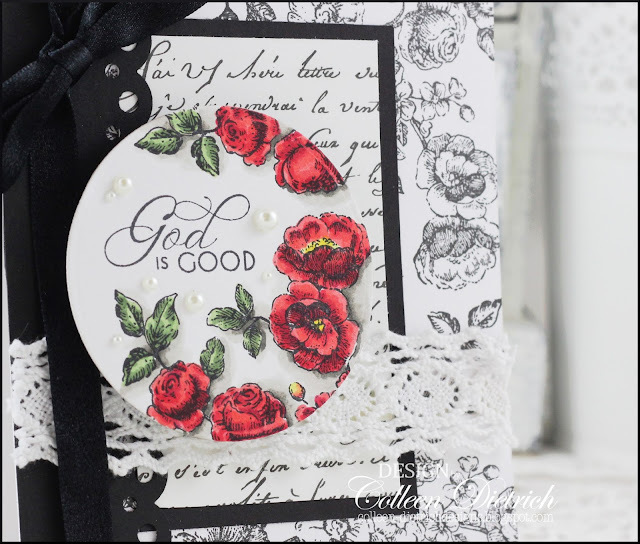 Stamps: flowers, leaves - Ruby Reprise - Papertrey Ink; Sentiments & Quotes - Altenew Paper: white - Papertrey Ink; Rose Red - Stampin' Up!Ink: Rose Red, Pink Passion, Pixie Pink, Pretty In Pink, Old Olive - SU; Memento Tuxedo Black - Tsukineko Accessories & Tools: rhinestones - Queen & Co. 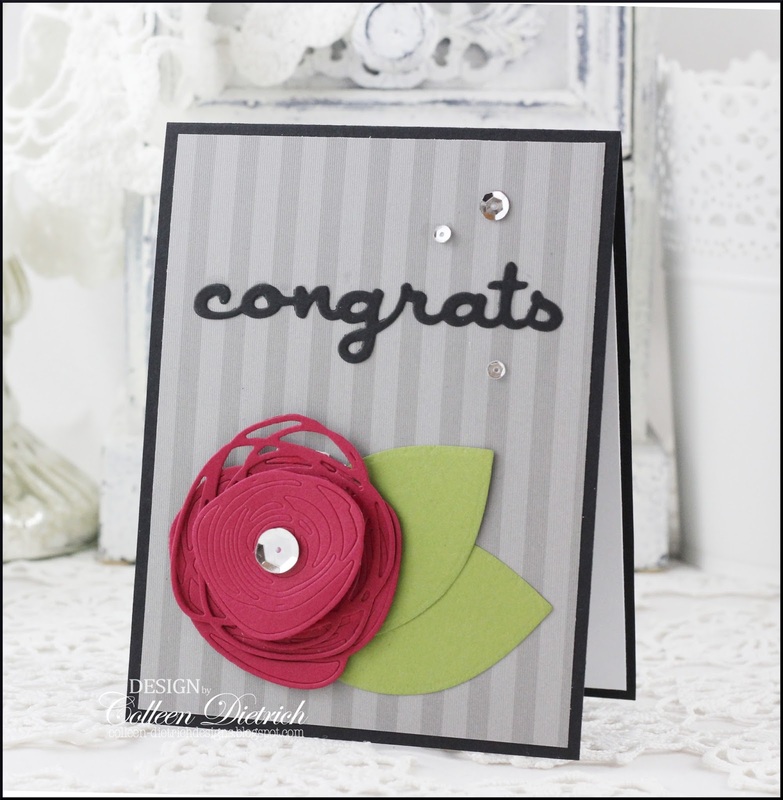 If this looks familiar, perhaps you saw this earlier version of the same card here on my blog. 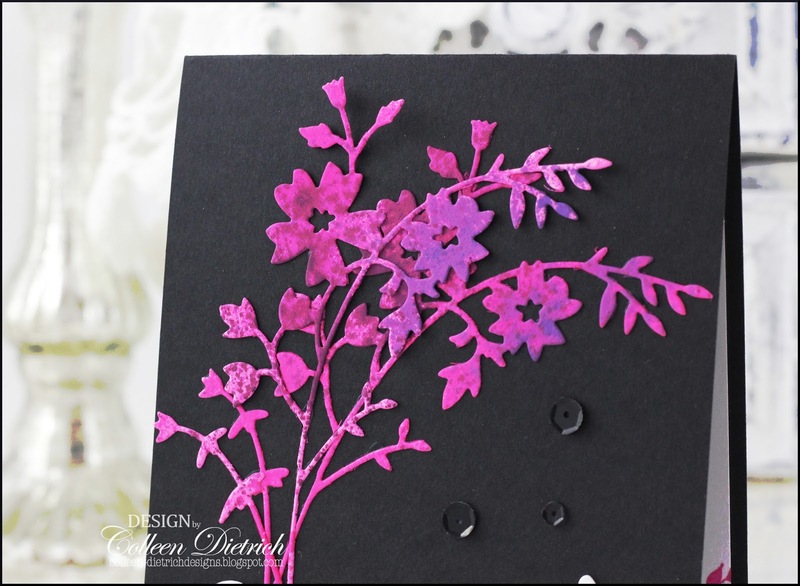 I skipped the glitter on this one, and added sequins and little hydrangea blossoms. This is my favorite version. ;-) It's a go-to design for wedding cards for the shop. 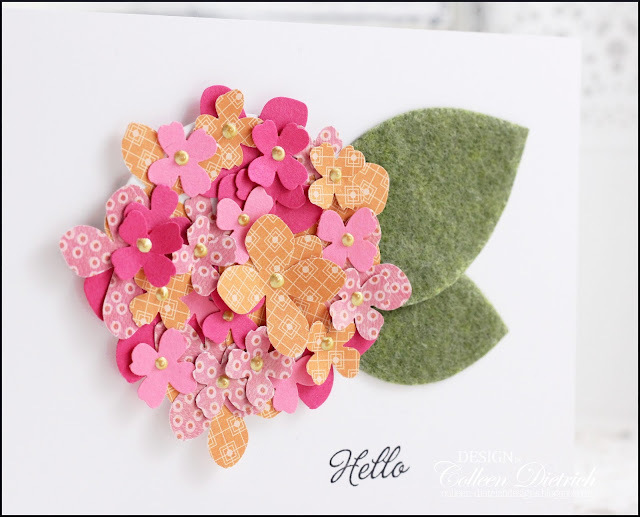 As with the earlier version, this card was inspired by Alicia Thelin's card on page 54 of Paper Crafts Magazine's 75 Creative Card Challenges. Thanks for popping by, and have a wonderful day! A little while back, I had just received the Papertrey Ink Circle Scribbles dies, and wanted to test them to make sure they worked well. (They do, but with a little extra pressure, because the detail is so fine.) I made two cards: one light and one dark. I paired the 'roses' with die-cut leaves, a PTI Wonderful Words: Congrats die, patterned papers and sequins. As you can see, I did not cut through the entire Circle Scribbles dies. That was not by design, but an accident. When I was testing the new dies, and had not applied enough pressure, this was the result. I decided I'd go with it, instead of tossing them into the trash. They have a beauty all their own this way! P.S. I LOVE reading your comments. Thank you for taking the extra moment to do so!! These wildflowers.....well, they kind of look like they are tie-dyed! I die-cut two Memory Box Honeyblossom Sprigs out of hot pink cardstock, then spritzed them with assorted pinks and purples from Ranger's Distress Ink Sprays. I LOVE how they turned out! I layered one over the other, with the top one slightly askew. 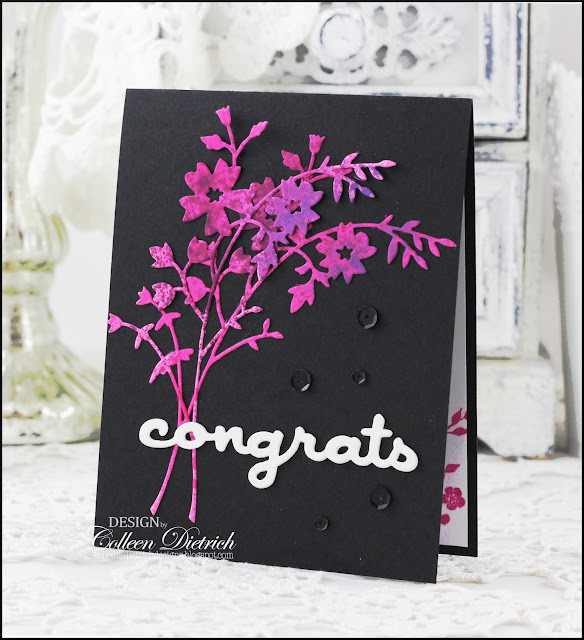 The best glue to use for something delicate and fine like these dies is Ranger's Multi Matte Medium. Once dry, the glue virtually disappears. Hope you had a nice weekend! We attended a family wedding in Cape May, NJ. It was fun seeing faces you love, all in one spot. :-D The bride looked ever so lovely, and so did her groom. They just glowed, you know what I mean? Sigh. Love, sweet love! Today's card doesn't need much explanation. Just another birthday card to fill the basket at the shop, strung with party banners, thanks to my FUN Petite Pennants Builder Punch by Stampin' Up! I need to pull that out more often. Thanks for coming by today, and hope to see you again soon! Hello there! The card I'm sharing today started with a small, puffy glitter heart. I found it on a sidewalk or parking lot, not really sure anymore. :-) In my mind, I said, "You're coming home with me," and stuffed it in my pocket. 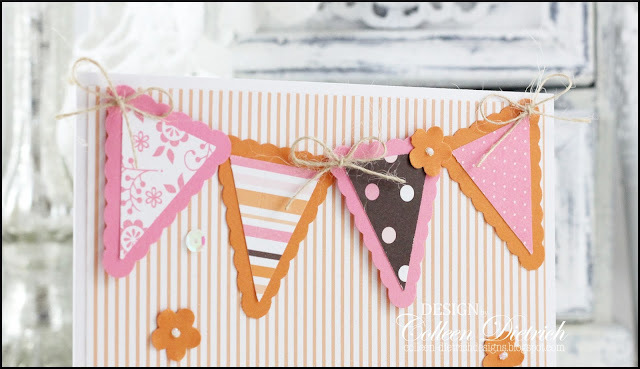 When I got back to the craft room, I started to gather various bits and pieces that were already on my desk, arranging things to see what looked best. The heart was literally the cherry on top, the very last thing I placed on here. The sentiment-in-tag was also already lying on my desk. 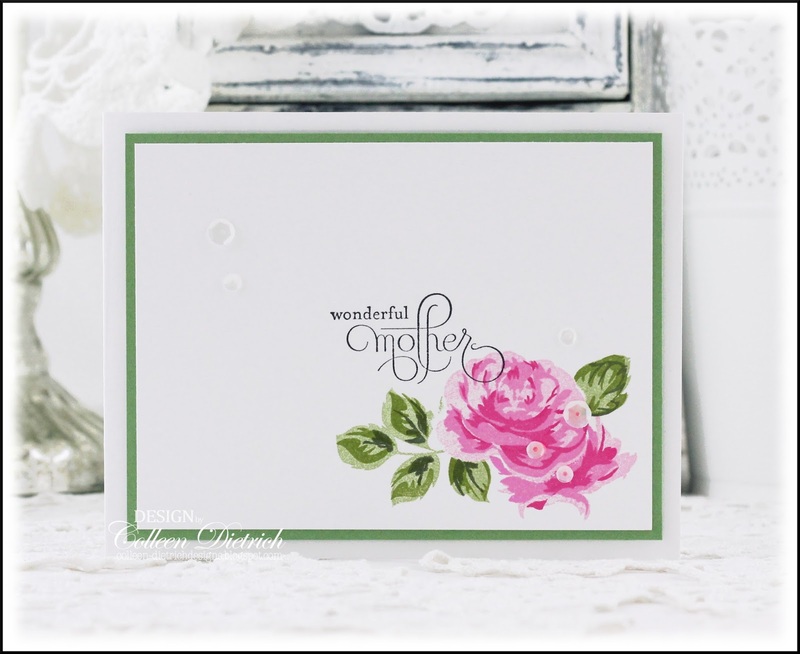 Some time ago, I had stamped several of these (from Stampin' Up! 's Holiday Home) and spritzed the heck out of them with assorted colors of Distress Ink Sprays. I knew each would find a home in time. It's a great feeling when you let your crafting supplies take you for a ride. It happened here, on this New Home card. The patterned papers -- which wound up being the sky -- were on my desk for another project, and I had already punched them out with the Fiskars Hexagonal Punch. 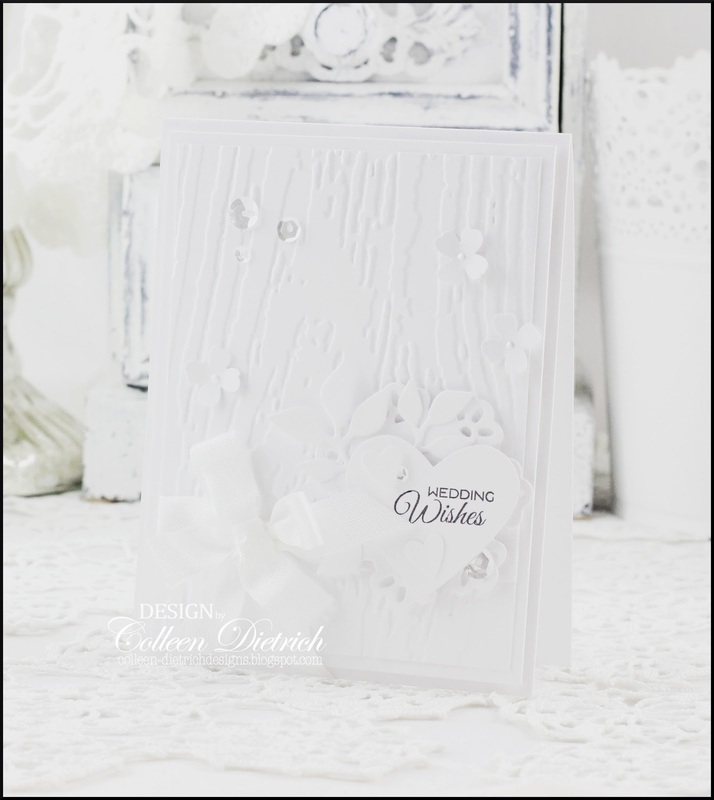 I started arranging the punched out pieces along the top of a card base, not knowing yet where it would lead. 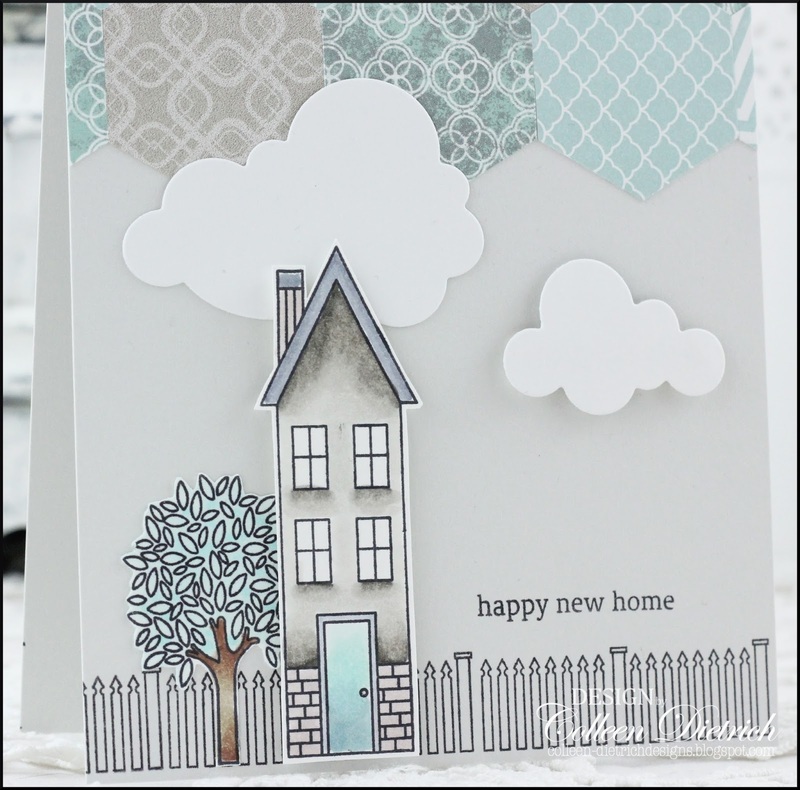 I knew I needed more New Home cards for the shop (they're a popular seller), so then I stamped a house image from Stampin' Up! 's Holiday Home and colored it in tones to match the patterned papers. Then, I added a fence, and clouds, and a tree. :-) A sweet little scene! 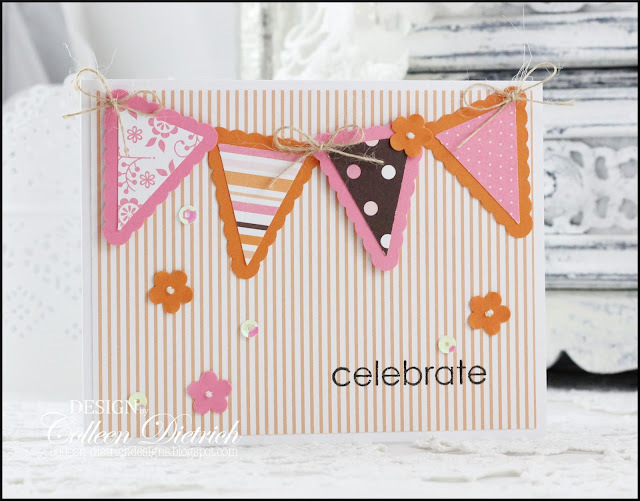 I love creating little scenes on card fronts. 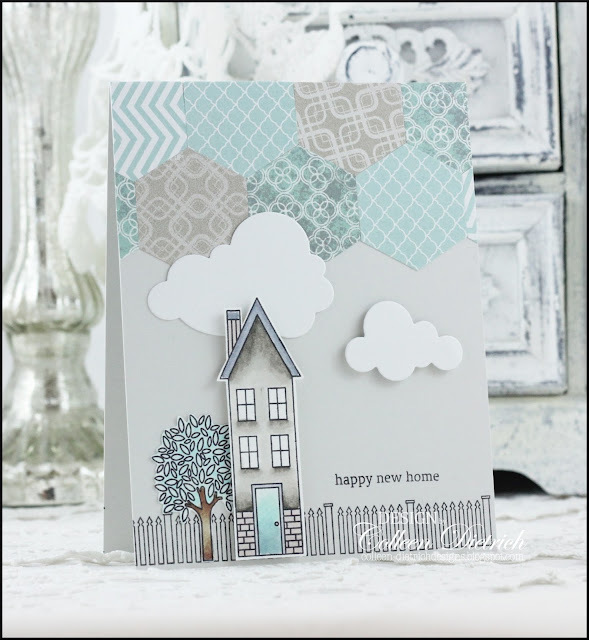 I have blended my love of miniatures (my dad and I built a dollhouse together when I was in my late teens) with cardmaking! Thanks for joining me today. :-) Be blessed, and have a wonderful day! Hello there! I hope you don't mind that I'm sharing an older card from the archives. I just really love it, and re-photographed it for this post. I used Stampin' Up! 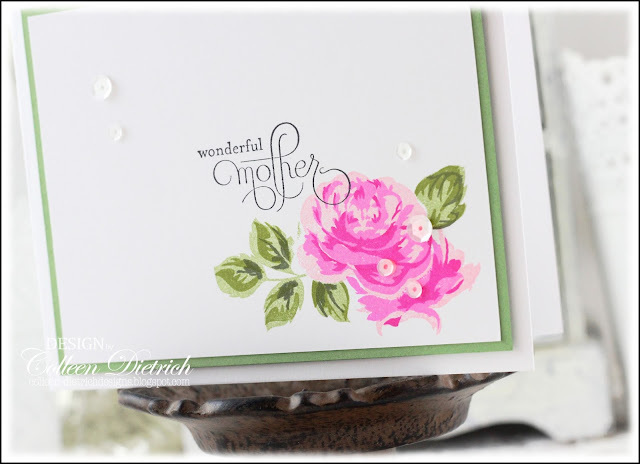 's Elements of Style for the roses, and a Hero Arts script stamp behind the colored roses. The sentiment is from Verve's Joy For The Journey. Thank you so much for your visit today. I hope you have a lovely week! 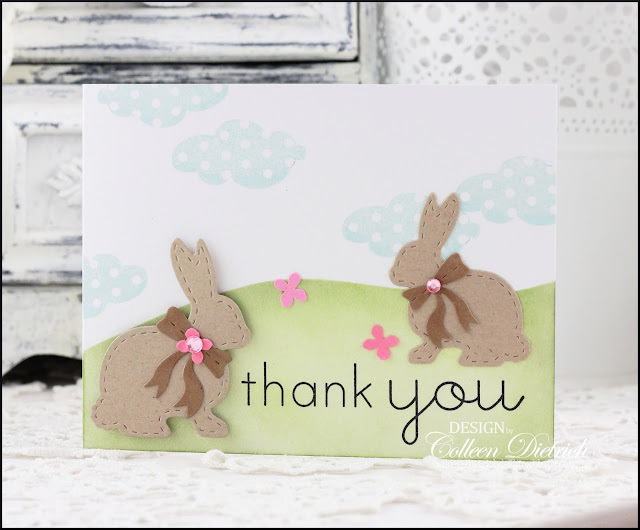 A friend of mine lovingly helped me through a difficult time, and I sent this bunny card to her as a small token of appreciation. 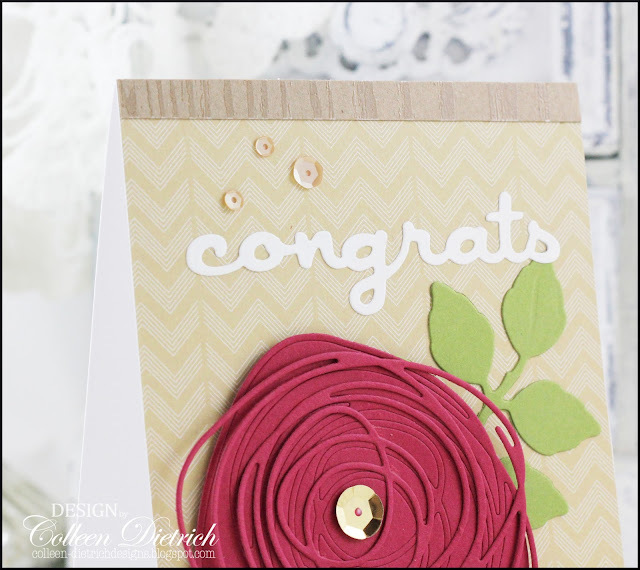 I adore making little scenes, so this card really tickled my fancy. 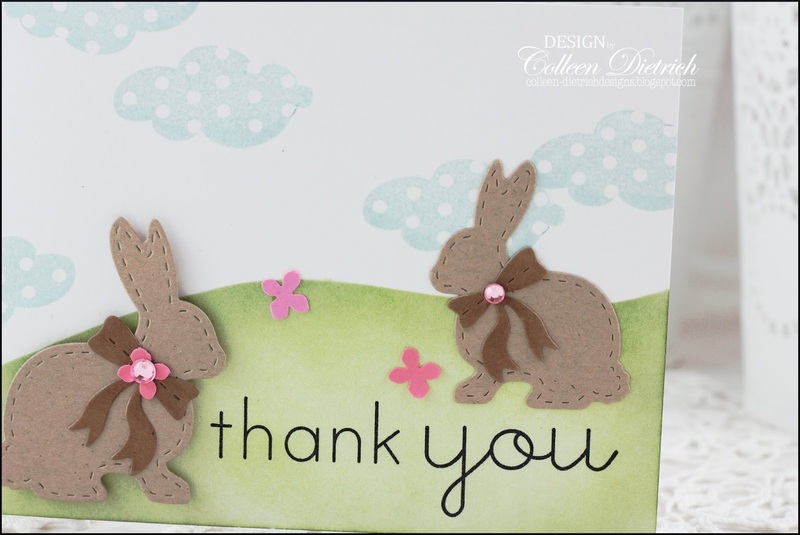 The bunny dies are from L'il Inker Designs, and I'd never have even known they existed if it were not for my friend, LeAnne. She has used this set time and again, and I love every variation she shows. :-) Thanks for enabling, LeAnne! Time for me to hop scoot back to work! Glad you joined me today. 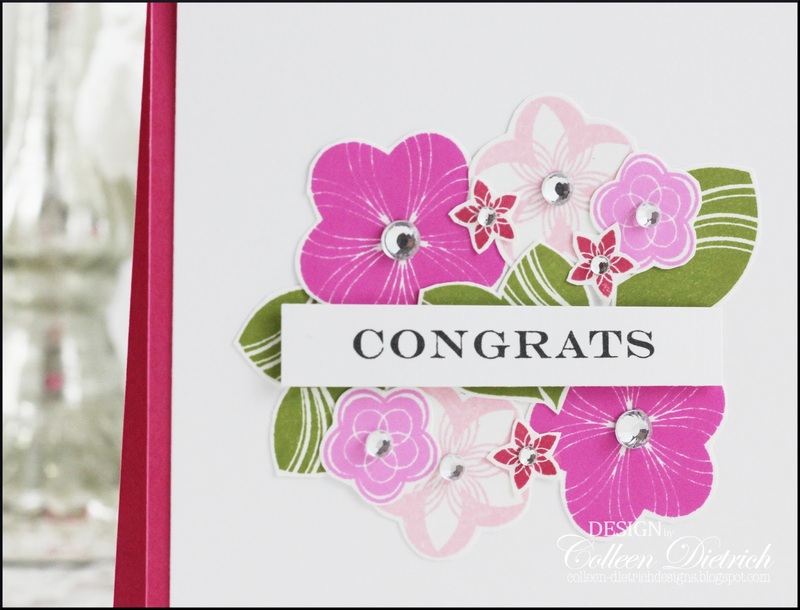 Stamps: (clouds) Springtime Beauty II - Inspired By Stamping; Think Big Favorites #15 - Papertrey Ink Paper: Crumb Cake, Soft Suede, Cameo Coral, Pixie Pink - Stampin' Up! ; white - Papertrey Ink Ink: Soft Sky, Pear Pizzazz - SU; Peeled Paint - Ranger; Versafine Onyx Black - Tsukineko Accessories & Tools: Bunnies & Bows dies - L'il Inker Designs; Hydrangea punch - Martha Stewart; pink gems - Queen & Co. I am so pleased with the way this card turned out. 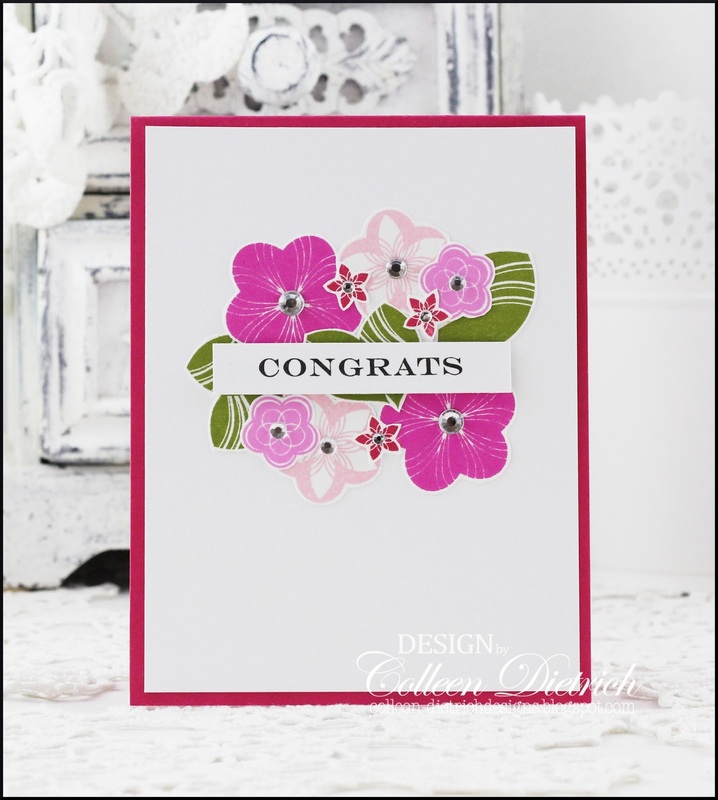 I envisioned a hydrangea blossom in really hot colors, and for fun, I added some patterned papers in the mix, too. 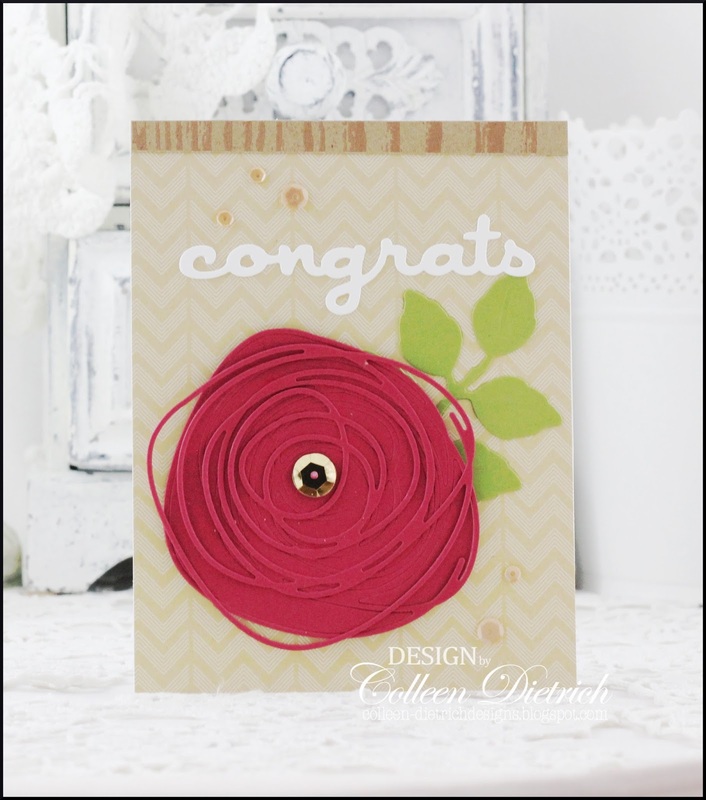 Learned the hard way that it is best practice to create this flower on a circle die cut or punch-out, instead of directly on the card base. All the gluing creates unsightly warping and buckling on the cardstock underneath the blossoms. You can see little peeks of a white circle under the tiny flowers, below. I popped up the whole flower head on foam tape by 3M for some dimension. 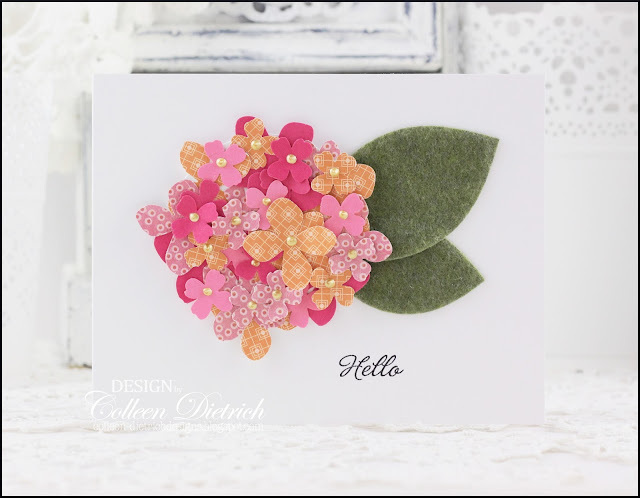 Those leaves were die-cut from felt, with Avery Elle's Modern Leaves. I scored that die set when iHeartPapers was closing down. I really like the clean, streamlined leaf shape. The most visible hydrangea florets each got a touch of Liquid Pearls in centers. 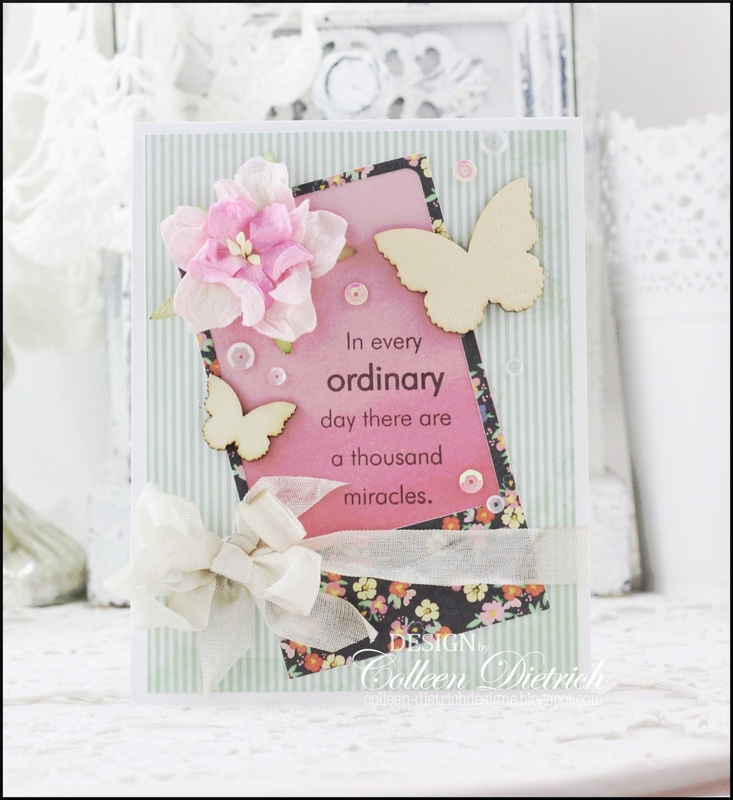 A small, sweet sentiment from Hero Arts was the only other touch added. Thanks so much for coming by to say Hello!